Due to size, this product ships in its original packaging. Packaging is the same as what is found in a retail store. Please keep this in mind if purchasing as a gift. Car Seat 4-30 lbs, Stroller up to 50 lbs. Families love the Adorra 5-in-1 Modular Travel System featuring the Mico Max 30 infant car seat! It has the supreme comfort you want to provide your child and all the features you’ve come to expect from a premium Maxi-Cosi product. The included Mico Max 30 infant car seat lets you give your baby a first class ride both on the stroller and in the car and features maximum comfort, safety, and style from 4-30 pounds. The Mico Max 30 is the lightest premium infant car seat in its class* and is comfortable to carry, making it the perfect infant seat for this premium travel system. It provides superior safety for your baby with Air Protect Side Impact Protection and an anti-rebound bar to make every ride safer. The base is adjustable to ensure a proper fit in your vehicle and features a one-click LATCH system for easy installation. Self-wicking fabrics deodorize and draw liquids away from the skin to help keep baby dry and comfortable during the ride. The seat has the comfiest cushioning available, and a reversible Cozi-Dozi insert provides head and neck support for smaller babies. Transferring the car seat to the stroller is easy and allows you to keep your new baby snugly in the car seat when switching from car to stroller. You’ll also enjoy taking strolls with your newborn in carriage mode which features a full recline and provides a secure enclosed space to keep infants comfy. As they grow, you can use the stroller mode in either parent or forward-facing positions allowing your child to see you during the ride or giving them a view of the road ahead. The stroller includes a Cozi-Dozi infant support for smaller babies and the super soft fabrics and padding ensure a comfy ride for all children up to fifty pounds. You’ll be comfortable too with the adjustable handle that lets you easily customize it to the best height. The handle also features a stylish leather-like grip that's easier to hold on to during your stroll. The extra-large basket flips down for easy access to items you want along for the ride and even expands to fit larger items. The cup holder and storage pouch give you a handy place to store smaller items. The seat liner not only makes the Adorra the comfiest stroller for your baby, but also reverses so that you can easily get a new look. When you’re finished enjoying your day out with baby, the stroller folds easily with the seat attached in either direction, making it easy to store away. Both the stroller and car seat are super easy to clean.The innovative car seat pad removes with no need to unthread the harnesses, letting you take it off in a few seconds. The car seat and stroller pads are both machine washable and dryer safe. Putting them back on is easy too, ensuring you can get easily get back to enjoying your day with your baby. 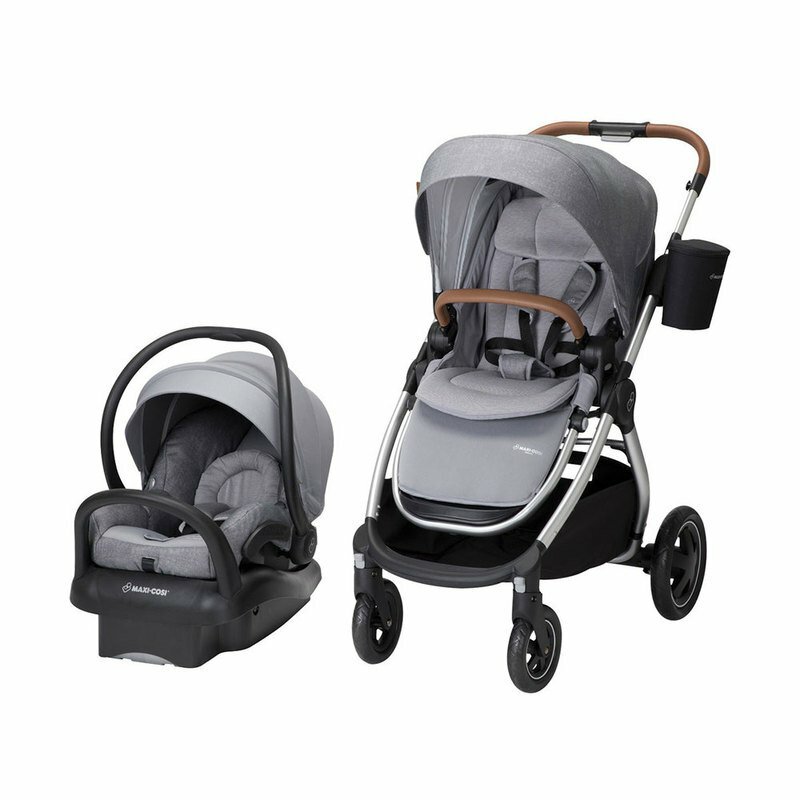 For a full featured stroller and infant car seat that provide both supreme comfort and ease of use, the Maxi-Cosi Adorra 5-in-1 Modular Travel System is exactly what you’re looking for. *When compared to similarly-priced infant car seats with the same weight range.